Futon is the Japanese word for mattress or blanket. What suprised me was that according to Wikipedia, it is now an English word derived from the Japanese word! In the U.S., when one thinks of futon, the image is the futon sofa, a thick mattress that is on a wooden frame that can be converted into a bed. However, for a Japanese person, a futon must be laid directly on the floor. The Japanese futon has several parts to it. The shikibuton: Shiki comes from the word hiku meaning to lay, and when attached to another word, the futon is now pronounced with a b and becomes buton, forming the word shikibuton. 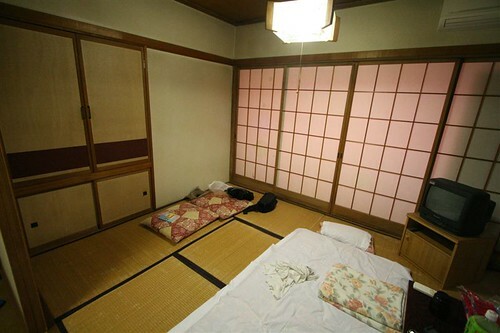 The shikibuton can consist of one or two mattresses. It can be one thick one, about 6″ thick or a combination of a thinner mattress laid on top of a foam mattress. Originally, there was only one standard size for a futon, which is about the size of a twin bed, but nowadays, they make double sizes too. However, that being said I would recommend the twin size beds because these futons are traditionally made from cotton and they can get pretty heavy. Today, there are a variety of materials to make futons, that include wool, cotton and synthetics. Kakebuton: Kakeru is the verb meaning to lay on top, therefore the kakebuton is the blanket. Again, there are a variety of kakebutons and they can range in various thicknesses and materials depending on seasons and temperature needs. Makura: The makura is the pillow. The traditional ones are quite small in size and are stuffed with buckwheat or beans . As you can imagine it does take a while to get used to such a hard surface if you are more accustomed to a soft pillow. Personally, I find that it lifts the head up too far so it is not really ergonomically friendly. Maybe it is high off the ground because of the fancy hairdos they used to have. Creates a multi-purpose space because it can be folded away and put in the closet. It’s safe. If you roll off the futon, there really isn’t much distance to “fall”, it’s more like you roll down to the floor. It’s super comfortable. Overall, the futon is quite a firm mattress since you are directly on the floor with no spring mattress in between. It has just enough cushion to give you a good nights rest. Makes a small room feel larger. Because you are on the floor, the room appears larger and it consumes less space. The weight of the kakebuton in the winter is very comforting. Not that it’s heavy, but unlike a feather or synthetic blanket, the weight of the cotton feels like it is giving you a little hug. I like that. Kids love them because you can’t “break the bed”! My boys would always wrestle on the futons and used them as wrestling mats. Care: When we sleep we perspire a lot and the cotton absorbs the moisture. Therefore, it is important to air out the shikibutons in the sun, otherwise they can get moldy and heavy. They can also get dusty, so many times you see people hitting their futons on the their balcony. For some, putting their bed in their closet and laying it out at night on a daily basis is troublesome. You can’t take a spontaneous nap, unless you make the effort to pull out the bedding! Futons are big. You need a fair amount of closet space if you want to put them away during the day. If you have difficulty getting up and down from the floor, futons may not be for you. The best part about the futon is how you sleep. I don’t know if it’s just me, but I think one gets better sleep. It’s seems that the sleep becomes deeper and therefore you are well-rested. This increases your overall health and well-being. Futons are great if space is limited and you need flexibility. It also works well, in small spaces like attics. By just throwing a futon on the floor when the odd visitor drops by, you can guarantee they will have a very restful sleep. So even if you have a small home, you still can be a very accommodating host/hostess! Hi, I know this is a really old post, but I had a question maybe you would not mind answering? I have a studio apt, and I am planning to sleep on a lightweight futon that rolls up and will be stored in closet during the day to save space. When I sleep on it , it will be on a wool rug on a wood floor. Also under a ceiling fan. In reading about Feng Shui, I come across over and over, don’t place mattress directly on the floor, also don’t sleep under ceiling fan (or in front of a window )…I pretty much will be doing all of these things. Can you suggest any fixes for these things? In the feng shui that I practice, there is absolutely nothing wrong with placing a mattress directly on the floor. Asians have slept on the floor for centuries! As far as sleeping under a ceiling fan, it depends on scale. Do you have a high ceiling? The more space between you and the fan the better. You can also use design principles using color. If you have a white ceiling and use a white fan, the fan will visually disappear. As far as sleeping under a window, it is best if your head is not against the window wall. Try placing the head of the mattress against a solid wall. If you have no choice and must place it against the window wall, make sure you have a window treatment lowered while you are sleeping. The draft may cause health issues. I am definitely interested in getting a roll-up sleeping mattress. In India, we used to use these thick cotton mattress which we rolled up during the day – it was comfy, saved space and was good for my back! I’m looking for something similar to buy here in the US and the Japanese futon seems to fit the bill. Can I ask where you bought your futon and how much it was? Your Indian mattress sounds exactly the same as the Japanese futon! In Japan they were made of cotton too. I haven’t bought any futons in the U.S., but hope to do so in the future. I’ve found a few websites that seem to fit the bill, including J-Life. I was wondering, though, how comfy are futons on hard floors such as hardwood or tile? The Indian one was seriously thick (10 cm or 4-5 inches) and you couldn’t feel the floor at all. When I was growing up, the futons had 2 mattresses. One was a foam pad that was placed down first and on top of that was the thick cotton mattress. They still use two mattresses in Japan, but I don’t know if they do that here in the U.S. .
You’re right, if the floor is very hard and the mattress is thin, you may find it a bit uncomfortable. You may need two. Test it out would be my suggestion. @Chloe, sounds like there’s sufficient padding, plus with a wooden base you should be fine. you are in reality a good webmaster. The website loading pace iss amazing. masterpiece. you have pertormed a wonderful activity on this matter! Sleeping on the floor is not a problem. Make sure your flooring is clean. If you are sleeping on a carpeted floor, make sure it is clean and vacuumed. You don’t want it dusty and dirty next to where you will sleep. Slightly higher off the ground is better in this case. Nice post!! I hope to have a chance to visit Japan. I want to know more about there culture. For those who would like the comfort of the futon, but would prefer not to or are unable to sleep on the floor, do you think that placing the futon on top of a mattress would be a better option than using a mattress topper? I never thought about placing a futon over a mattress but that’s not a bad idea of you don’t want to sleep directly on the floor. Why not give it a try? You may want to air out your futon in the hot sun once in a while to freshen it up and remove moisture. Thank you for your prompt reply, and maintenance tips. I really enjoy utilizing the sun so airing the futon out in the hot sun sounds like sage advice to me. Things have been hectic, so I’m now getting back to you. I would like a Japanese-made futon which is an investment at this point, but I’ll certainly let you know how things work out. I’m looking into buying a queen size Matsu brand shiki for my husband and I but I’m not sure how many layers I should be getting. Right now I’m 6 months pregnant, so I have to sleep on my side. I’m worried if I go too thin my shoulders and hips will hurt. I don’t want to waste money on getting it incredibly thick if I don’t need to though. Any advice? And thanks for this article! I wouldn’t even be looking into futons if I hadn’t read it. Congratulations on your pregnancy! What an exciting time for you and your husband. I don’t know how thick this shikibuton is. Thicker the better. If it’s too thin, than you can add a foam pad underneath. Another thing to consider is what type of flooring are you putting this on. Is it concrete underneath or plywood and hardwood? Does it have any give? Don’t forget, in Japan, they are placed over tatami mats which have some give and are raised slightly above the ground floor. If you have a very hard surface it will affect your comfort level. Hope this answers your question. @caledonia, that’s great that you are so open to other cultures! I’m considering buying the J-Life International Double size Kakebuton to use with my western, full-size bed. I know it is smaller than a fullsize comfortor, I’m wondering what you think, if it will fit ok or look silly? I’d double check the measurements of your bed and the kakebuton to make sure it’s big enough for your particular bed. I’ve read feng shui tips that recommend having a solid headboard behind your bed, having walking space and night stands on the left and right, and, like others have mentioned here, having empty space below the bed. Even if you think the space under the bed is a non-issue, with the other guidelines still in play, would it not just make more sense to have a stable, permanent bed frame? If you’re going to have a headboard and night stands there anyway, then there’s already some permanent space being taken up in that area. Plus, these tips seem to be treating the bed like something that should be kept very safe-feeling and stable, not something temporary and fleeting that you keep picking up, putting down and moving around like it seems you would with a futon. What do you say? @Blake. If you have the space that allows a permanent bed frame, yes, you’re right, it does make to just have a permanent bed frame. The futon was used because they lacked the space to have many rooms. Each room had to be multi-functional. I am puzzled by a symbol on a dress I bought from a firm in China. Label has a round circle with letter P in middle. No laundry charts show what this means for laundering? Have you any idea? Can a futon be aired out by placing in on a drying rack or installing hooks that you can use to hang it up on a wall while not in use? Yes, those sound like good ideas. I prefer the drying rack because both sides will be exposed. What about encasing it in a waterproof mattress cover? Would that stop the moisture from seeping in? @Giant: Sleeping on a waterproof mattress cover really isn’t comfortable. You’ll find that because the cover isn’t breathable, you’ll perspire and may have trouble sleeping. Thank you for the nice post. Have you had experience with wool futon? Are they less care than cotton ones? Also, is there any reputable distributor you could recommend? Hello,I check your blogs named “The Pros and Cons of the Japanese Futon | Asian Lifestyle Design” daily.Your story-telling style is awesome, keep it up! And you can look our website about proxy list http://proxylistdaily4you.blogspot.com/. Hi, I bought a shikibuton with tatami mat a year ago. I’ve been having trouble figuring out what pillow to use – I’m both a side and back sleeper with broad shoulders. If the pillow is too thin, I get pain in my neck because of side sleeping without enough support. If the pillow is too thick, then it’s not comfortable sleeping on my back. I’m trying to go really thin and use my arm under the pillow, which seems to be the most comfortable position, but I keep waking up during the night, I guess because I’m not used to it. But I’ve been doing it a couple of weeks now and I’m still waking up. I don’t know what to do 🙁 I love my Japanese futon, I don’t want to give up on it..